The mailbox at home is not just a regular mail receptacle. The mailbox is actually your way of saying “here’s my home” to others. So having a great looking mailbox is an asset as it represents your style and identity. One type of mailbox that exudes class, style and elegance is the copper mailbox. Here are 5 things you should know about this mailbox. 1. Copper is a hardwearing and durable material. That is why it makes such a great material for a mailbox. A mailbox has to faithfully wait and protect your mail from all the elements outdoors. Having it made in a strong material is a must. 2. Copper does not rust or corrode. 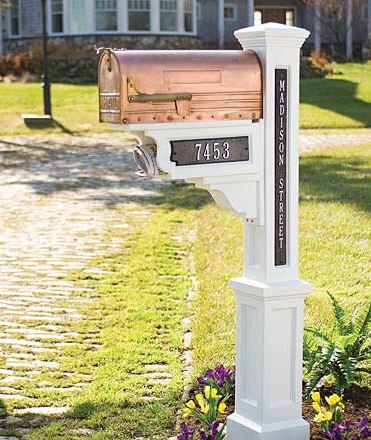 Thus if you own a copper mailbox, not only will it be able to withstand all the natural elements outdoors, it will not rust or corrode on you. The mailbox can be used in any area and it doesn’t matter if you reside in an area that receive lots of rain, snow or salty sea air, your mailbox will still be able to look good without rusting and corroding. 3. Copper gets better with age. Untreated copper goes through a natural coloration process over the years and gains a greenish tint known as patina. Patina is what you see when you look at Lady Liberty. So you can see the appeal that copper has. The patina on the mailbox will make it look more rustic and whimsical. A weather beaten looking mailbox has such a charming look to it that it will definitely add to the beauty of your home. 4. Copper mailboxes can have several finishes. If you decide that the patina finish is not your style, and you want a mailbox that will retain its shiny appearance for many years, then you have the option of using a mailbox with a non toxic lacquer topcoat. Or if you want something even more distinct, you can opt for the hammered copper mailbox where the mailbox has beautiful indentations made through the process of hammering. 5. The copper mailbox is also available in many styles and designs, so there will definitely be one to suit you and your home. You can have a curbside or a wall mounted mailbox. You can have a large or a small mailbox. You can even have a mailbox will motifs of flora and fauna on them. The above are 5 great reasons for you to get the copper mailbox for your home. The mailbox will be such an asset that you will love having it around for many years to come.